Short and sweet is exactly what this post will more than likely be. Had an issue with my watermark app. Still not as it should be, but no more wasting time on it!! Plenty of stuff going on here. Girls dancing. New appliances coming in. AND lots of quilting!! I will give you a hint...all the quilts are flannel. :-) If you have been following Lisa Bongean's blog or Primitive Gatherings website, then you get what I am laying down here. I quilted this a while back...remember I am a slow blogger. Short and Sweet is a beautiful little quilt designed by Kim Diehl from her book Simple Charm. I have loved this quilt from the first second I bought the book! I actually texted a photo of it to Lisa and mentioned that is would be a great kit for them to do. Wool and reproductions...what's not to love?? Imagine my excitement when I got the shop sample to quilt!! Feathers and curved crosshatching for the quilting. Simple yet elegant. I love all the wool petals. This would be a great quilt to do a charm, wool or 9 patch swap with friends. I decided after quilting some of the border design. It might have even more visual appeal if I filled in a basket weave design. Of course, you can never go wrong with feathers. The quilting showed up beautifully on the backing. Pretty sure this is going on my long list of projects I want to make. Specifics on the quilt...all So Fine Threads. Dream Blend for the batting. 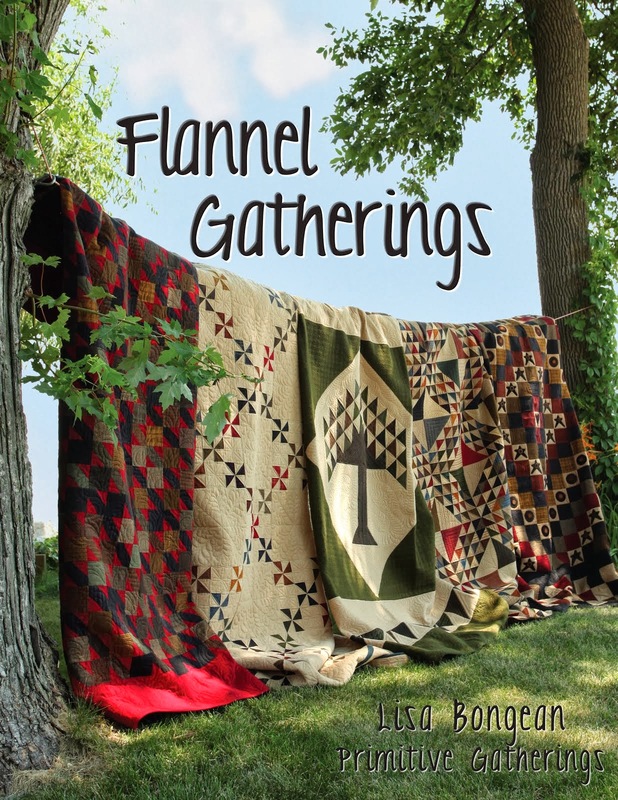 Primitive Gatherings has full kits, the book, wool kits...many options for this great little quilt here. Очень красиво! Стежка - супер, рисунки очень подходящие. I do love that quilt, and her patterns. You really did a beautiful job on the quilting designs, perfect for that quilt. Once again... gorgeous quilt, gorgeous quilting! Just beautiful! You did an excellent job quilting it!!!! A real beauty. A lovely collaboration of quiltmaker and quilter. Oh and I HEART flannel and I am a secret hoarder of flannel. Oh my, this is gorgeous---I too have loved this pattern since I got the book---it's definitely on my list, and thanks for the suggestions for swaps, etc. My heart is going pitty patter over this one, Linda! Your quilting is evolving so wonderfully! What a great idea for a swap on it, too! The quilting design works so well with this Kim Diehl design quilt. I have been admiring a version of this quilt on another blog for several weeks. Absolutely gorgeous! 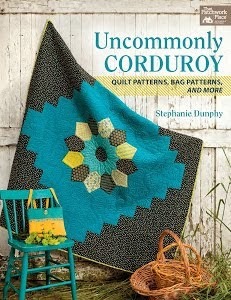 I have this book and always gravitate towards this quilt. Thanks for inspiring me yet again! Aack! You're killing me here! What a beauty! I love that quilting once again. You continue to amaze us. I love all Kim Diehl quilts :D And have all of her books. Good stuff! Absolutely gorgeous quilt and the quilting makes it OOOO La La!! Oh,how pretty! And you hand quilted it? Love the basket weave on the outer border. Sounds like Lisa is lucky to have gotten this one back from you. ;) I love all of Kim Diehl's designs and you added the finishing touch! Your quilting is absolutely fabulous! The quilt is lovely as is your quilt work , but it does look perfect in your house... maybe put it a bit nearer to the top of your 'want to make' projects? Is your list as long as mine...? This pattern has been on my To Do list ever since I saw it in Kim's book. I didn't have the fabric on hand to make it, now I do, or at least it's on the way. I wonder how many kits you sold for Lisa today! Great Job, all the way around! Your quilting is just "over-the-top". You are such a gifted person. Hugs. Beautiful as always. I can see that on my table too. Stunning...the design, the fabrics and the quilting is the icing on top of the cake. What a wonderful quilt. The quilting on the border is amazing. Have always loved this quilt, too. I have loved this quilt since the first time I saw it. It's on my list, too. It looks gorgeous on your table with the lantern. And, your quilting adds the perfect finishing touch!! !